Plot: Without giving anything away, the film is about a son going to see his father before the father passes away. The son wonders about the life his father has led, and if it was all just exaggeration. 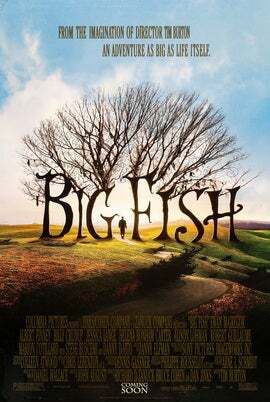 Why you should watch it: This film, released in 2003, is one of Tim Burton’s quiet successes. For every film that Burton releases with Johnny Depp, I wish there was a companion film that didn’t. This is one of those films that I wish Burton would make more of. It’s more akin to the style and tone of Edward Scissorhands. While it reminded some of Forrest Gump without the simple lead, I feel the movie stands on its own. It shares some plot similarities with Gump, but the story is solidly told. The vastly underrated Billy Crudup is Will Bloom, son to Albert Finney’s older Edward Bloom. He is visiting his father in an attempt to reconnect as his father slowly slips away. Finney weaves tales of his youth, portrayed by Ewan McGregor, to help bridge the distance he and his son unfortunately share. Along the way, each story told by Finney becomes more and more incredible, hence the “big fish” story. His life, it seems, has been larger than life, and he has experienced everything the world has to offer and more. Along with these characters, we meet Edward Bloom’s wife Sandra, portrayed by Jessica Lange and Alison Lohman. Edward’s pursuit of his love is as fantastical as the experiences he’s sharing with his son. Sandra weaves in and out of Edward’s life, yet we know the outcome having met her as the older Sandra. The excitement is in the telling, though. The romance never seems forced, and leaves the viewer with the feeling that destiny had a hand in their coupling. The supporting cast includes Marion Cotillard, Steve Buscemi, Danny DeVito, even a young Miley Cirus, as well as Burton regulars Helena Bonham Carter, Deep Roy, and Missi Pyle. While the trailer doesn’t exactly inspire a desperate need to watch this, the film is enjoyable. On a personal note, as a guy who lost his father over 15 years ago, movies that connect fathers to sons resonate with me. Perhaps that’s why I look at this film from a unique perspective, and maybe that’s why I enjoy it so much. The movie is available on Netflix. Give it a watch and let me know what you think.